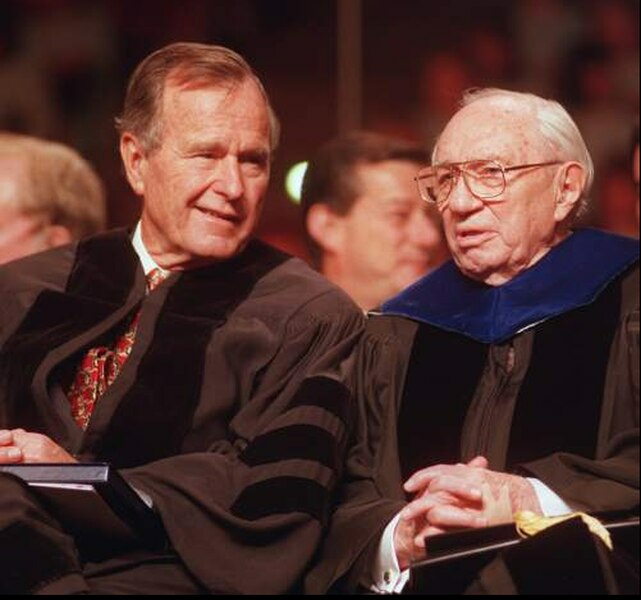 (Tribune file photo) Former president George H. W. Bush visits with Church of Jesus Christ of Latter-day Saints President Gordon B. Hinckley prior to the 100th anniversary observance at Southern Utah University on May 2, 1997. President George H.W. Bush — back before he was using his middle initials — visited Utah three times during his one term in office. And all three times he was campaigning for a second term he didn’t win. Sept. 8, 1991 • President Bush flew into the Salt Lake City International Airport, where he was greeted by a crowd estimated at 7,000. He met with leaders of The Church of Jesus Christ of Latter-day Saints; visited patients at Primary Children’s Hospital, and later attended a $300-a-plate fundraising dinner. He ducked out of that dinner early, joking that the vegetable course was disguised broccoli — and his disdain for that vegetable had become well-known. Sept. 14-15, 1992 • The 1992 campaign brought both major-party presidential candidates to Salt Lake City for a National Guard convention. Both flew in on Sept. 14 and delivered speeches on Sept. 15. He was voted out of office seven weeks later, but he did win Utah with a plurality — 43.4 percent of the vote to 27.3 percent for Perot and 24.7 percent for Clinton, making Utah the only state where the newly elected president finished third. Bush visited Utah again for a May 2, 1997, ceremony at Southern Utah University in Cedar City. As part of the university’s centennial, the school gave an honorary degree to Bush.